A disturbance is centered about 850 miles southeast of the Big Island. At this point the disturbance is small and is staying well south of the Islands. The disturbance may be classified as a depression later today. Last edited by Caribbean Traveler on Sat Aug 09, 2008 9:09 am, edited 4 times in total. The disturbance is no doubt a depression at this point. A low level spin is quite apparent with deep convection already formed. There is potenital for this to become a tropical storm in the next 24-36 hours as it heads west. It is centered 900 miles southeast of Hilo. At this point it looks to pose almost no threat to Hawaii except for increasing swell on the south facing beaches over the next several days if development continues. 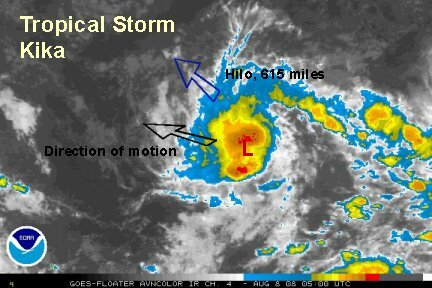 Look for the Central Pacific Hurricance Center to upgrade this to a depression soon. 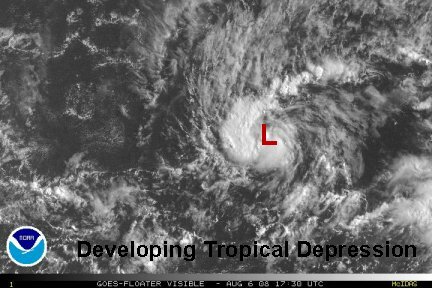 The disturbance was upgraded to a tropical depression on the 5 pm HST (11 pm edt) advisory. It is centered near 10.5 N / 147.4 W or about 815 miles southeast of Hilo, HI. It continues to intensify and looks to be on the border of becoming a tropical storm. Convection has built around the center and the outflow aloft is improving. It remains well south of Hawaii. Kika is centered near 11.4 N / 148.5 W or about 750 miles southeast of Hilo. The Pacific Hurricane Center upgraded the depression to a minimal tropical storm. 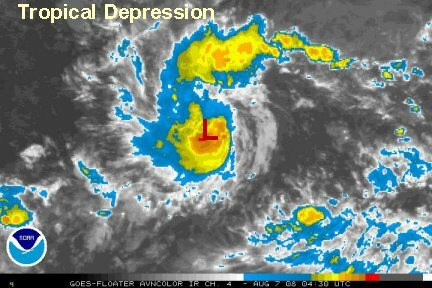 As mentioned in our last update, we throught that the depression was close to t.s. stage. The estimate of 40 mph looks good. 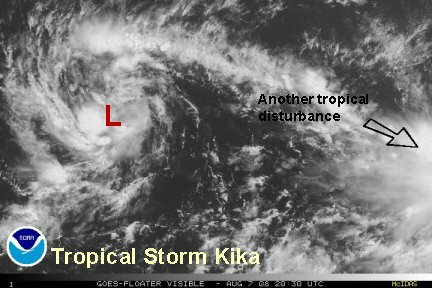 It appears that Kika is holding its own over the past several hours with little change. Kika will pass well south of Hawaii. Kika has changed very little today. Currently it is centered near 10.6 N /150.2 W or about 710 miles southeast of Hilo. We have Kika centered a little south of the Pacific HC position. It looks like it is facing some easterly shear and continues to barely hold on to tropical storm strength. 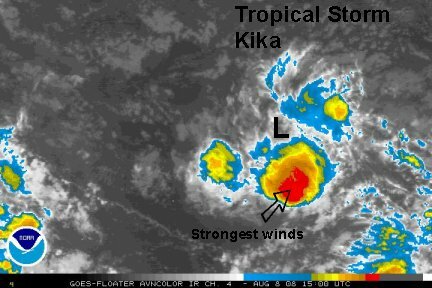 If fact our estimate of top sustained winds are now 35-40 mph, so Kika may be just below tropical storm strength. It is interesting to see how active the monsoon trough is in the eastern and central Pacific. There are two disturbances about 500 miles east and west of Kika, as well as Hernan west of Mexico. Kika will pass well south of Hawaii. Kika is centered near 11. 3 N / 152 W or about 615 miles southeast of Hilo, HI. It is moving west-northwest at 15 mph. Kika definitely is becoming better organized and has gained deep convection around the core of the circulation. Top sustained winds are about 45 to 50 mph. Look for further strengthening into Friday. Kika remains well south of Hawaii, but if the strengthening continues south facing beaches should see an increase in swell. Kika is centered near 11. 2 N / 154 W or about 590 miles south-southeast of Hilo, HI. It is moving west at 12 mph. It appears that the center of circulation is inbetween two convective bursts. The strongest winds are associated with the southern thundershower complex. That's where winds are probably 40 mph. Overall, little change has occured since the last update, maybe just a touch of weakening. 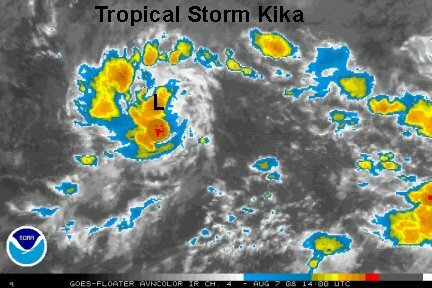 With this being the case, Kika is a minimal tropical storm. 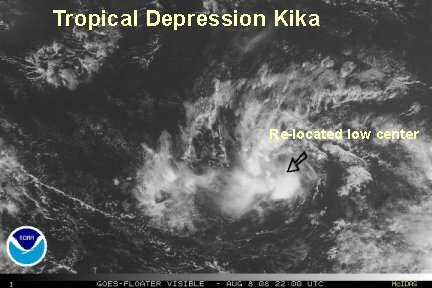 The CPHC downgraded Kika to a depression. We agree with this assessment as a new center of circulation has developed farther east. The center is now near 9.8 N / 154.2 W or about 685 miles south of Hilo, HI. Kika still has deep convection with the new circulation, so it's not out of the question that it will rebound to tropical storm strength. 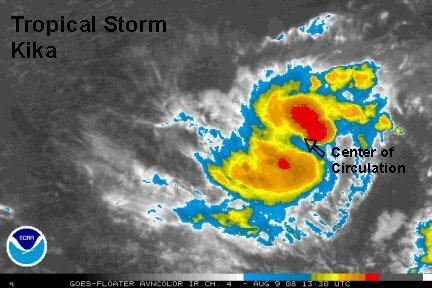 Satellite imagery indicated that Kika became a tropical storm several hours ago. Shortly after the center reformed, deep convection built around the center. In fact, Kika looked the most organized about 4-5 hours ago. We estimate that top winds are in the 45 mph range. Kika is centered near 10.1 N / 157.1 W or about 805 miles southeast of Honolulu at 10 am edt (4 am hst). It is moving west-northwest and will be moving away from Hawaii. This will be our last update on Kika since it is now south of Honolulu and moving away from the Hawaiian Islands.